2019 marks the 300th anniversary of the publication of Daniel Defoe’s groundbreaking novel, Robinson Crusoe. 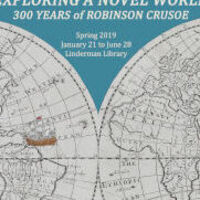 Through the display of early editions of Robinson Crusoe, other writings by Daniel Defoe, and works on natural history, navigation, and other sources from the 18th century, this exhibit looks at the world of this well-known novel. Often abridged for a juvenile audience, the central themes and conflicts of Defoe’s timeless novel (mutiny, castaways, and survival) have been revisited by countless authors in a multitude of formats.